Dr. Sutheerayongprasert is an enthusiastic spine surgeon. 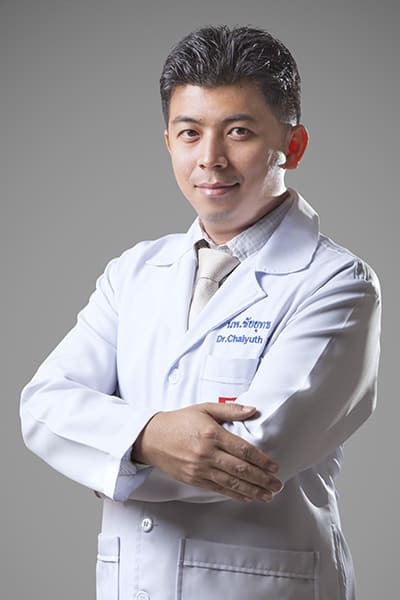 He graduated from one of the best Thai Medical Institutions, Faculty of Medicine Siriraj Hospital, Mahidol University in 2002 (second degree honor) where he also completed his Orthopedics residency in 2009. His special interest in spine surgery brought him to an advanced training program in spine surgery. He completed his advanced training from an integrated (Orthopaedic and Neurosurgical) program at Bumrungrad International Hospital, Bangkok, in 2010. Dr. Sutheerayongprasert is qualified in non operative care; including spinal intervention (eg. injection) and pain management, and Minimal Invasive Spine Surgery (MISS) which nowadays has been accepted as a gold standard of care in spinal surgery. His strong intension to provide world class patient care, and his well-trained experience of more than 200 cases in variety of both spinal disorder and spinal trauma cases have enhanced his surgical skill to the high level of expertise in spinal surgery. Dr. Sutheerayongprasert is currently an active member of both Thai and International Academic Societies including Thai Medical Association, Spine Section of Royal College of Orthopaedic Surgeon of Thailand and AO Spine International Organization. He also currently works as a full-time spine surgeon at Bangkok Hospital Phuket, serving local and international patients with professional skills and excellent service.